A retro science-fiction epic set in Victorian England, "Steamboy" features an inventor prodigy named Ra Stim who receives a mysterious metal ball containing a new form of energy capable of powering an entire nation. This young boy must use it to fight evil, redeem his family, and save London from destruction. The lush Victorian interiors and the elegance of the era's mechanical design allows Otomo to create dazzling visual backgrounds and machines for this film. 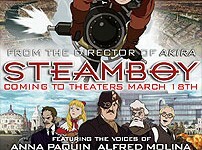 With more than 180,000 drawings and 400 CG cuts, "Steamboy" is sure to be one of the most elaborate animated features of 2005.